Bob Petricca, of West Hills, CA, a suburb in the San Fernando Valley section of Los Angeles, has been in the exotic car business for 40 years and has heard every “barn story” there is. You woulda thunk he’d be skeptical of each new story, as so many leads evaporate—Jag XK120s turn out to be Austin Healey Sprites, that sort of thing. The lead came from a lady whose deceased brother had been a scientist. She called Petricca up and asked if he was interested in it and, hoping against hope that this would not turn out to be just another urban legend, he drove over to look at it. Her story was true. 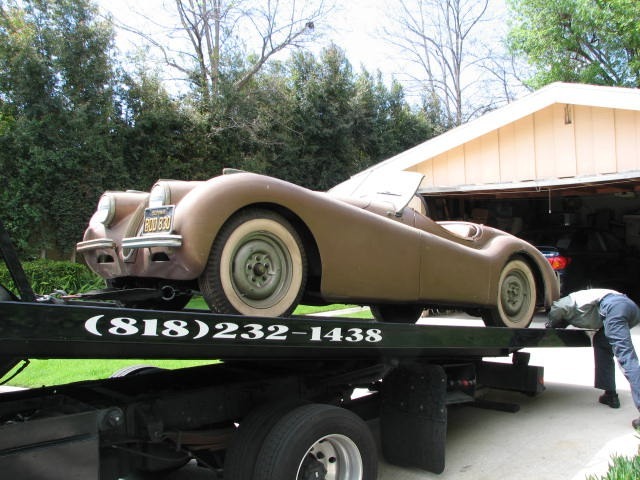 Better yet – the car was stored a mere eight miles from his house. Petricca knows 120s. He has bought and sold a dozen of them. 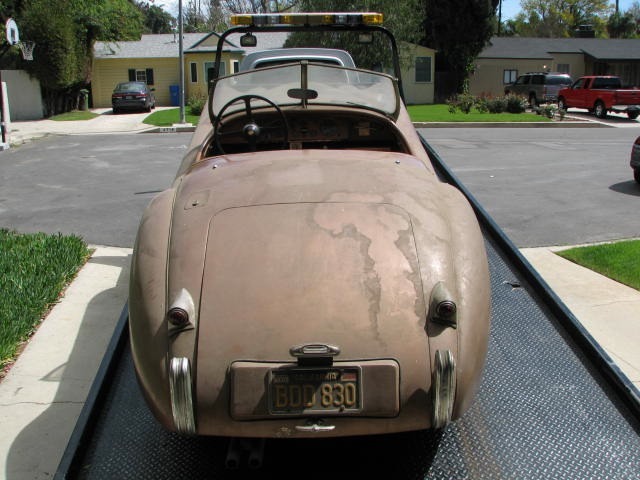 But what makes this car remarkable is that it is a car buff’s dream: a two-owner totally rust free California-domiciled car that was stored right. The lady told him the story. Her brother, a research scientist, had bought the car in 1961. He drove it until one day in 1966 when he experienced a small engine fire in the carburetors. 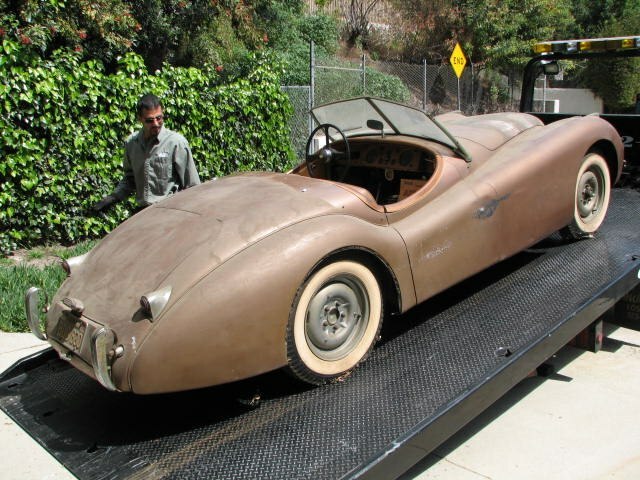 He parked it in his sister’s garage in nearby Sherman Oaks, figuring he’d fix it soon. But he was called upon to work in Washington D.C. and never returned to California. 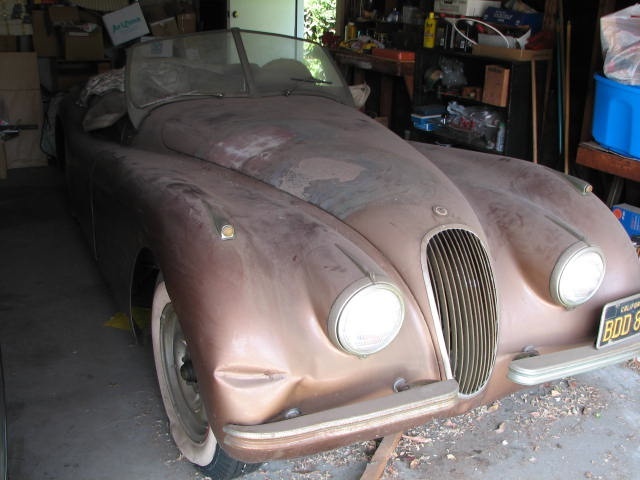 The Jaguar is a 1951 XK-120 roadster from the third year of production with serial number 670664. Petricca was particularly happy that the car came complete with a tool kit, side curtains, a convertible top which he believes may be the original, a spare tyre and wheel, and the jacking kit. It also came with the steel side skirts. Ironically if you ordered the wire wheels, it did not come with the skirts, which couldn’t clear the knock offs. 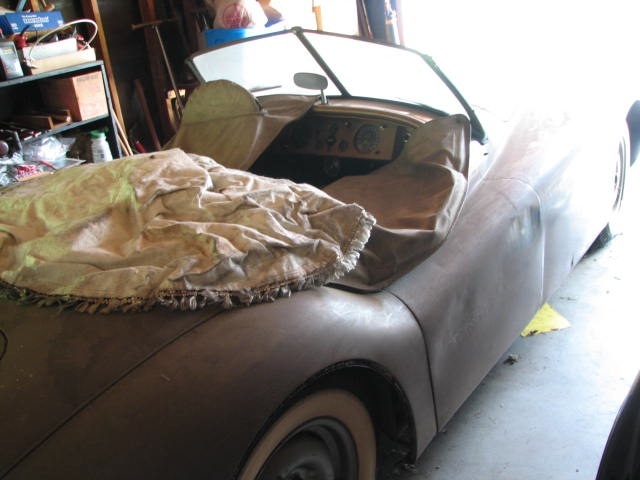 The paint and body have a bit of wear and will no doubt be redone when the car is restored. Wallace Alfred Wyss is a writer who now is becoming discovered as a painter. To see his paintings of classic cars, go to www.velocetoday.com/products-page/art-and-models. Wallace…Very cool story and photos. Thanks for sharing it. Makes one wonder how many other Barn Finds are still out there. A great article and I remember several books that Mr.Wyss had written and they are excellent and my collection. I wish Mr. Wyss is going to write some more books on Exotic Cars like he has on the High Performance Fords, and on the Lamborghini Muira. Please let me know what car books Mr. Wyss has on the market at this very moment? I love to hear about these stories. I would not restore this car except mechanically the patina is killer and you just don’t see them like that. OG paint rocks!! PANTERA with David and Linda Adler Price?